The year was 1986. I was a freshman in college and laying the ground work to attend my very first concert. I was flat broke so like any good college freshman I asked my dad for the ticket money. And like any good dad, he didn’t give it to me. But he did say that if I would clean out the garage, he would give me an old stereo that was in there. So I did and got $25 for it at the local pawn shop. That was enough money for a ticket and gas for me and three other friends to pile into a car and drive five hours to hear Stryper in concert. I didn’t catch one of the Bibles tossed into the audience, but I believe I slightly injured the church lady who scrambled for one at the same time I did. I remember the long drive back from that concert—we certainly didn’t have enough money for a hotel—and I recall saying to one of my friends, “That is what I want to do for a living.” I didn’t necessarily want to work with Stryper. That idea was, of course, way too far-fetched. No way could I ever work with a band of that caliber, but I just knew I wanted to be in music—somehow, some way. The feeling Stryper gave me at that concert was one I never wanted to let go of. And I didn’t. Fast-forward to 2001. Since my days of selling stereos at seedy pawn shops to get concert money, I had built a successful artist management company, Deep South Entertainment. Over the years we handled the careers of greats like Bruce Hornsby, Little Feat, Marcy Playground, Allison Moorer, Parmalee, and Vienna Teng. But Stryper remained my passion. So one day that year I decided to research what my old heroes had been up to since their unceremonious break-up in 1991. I knew Michael had put out some solo records, and I just assumed that, out of the four guys in the band, he would be the most approachable. On the Internet, he had a website but listed no email address. He did however list a PO Box for correspondence. I wrote him a letter and mailed it to him. In that letter I basically explained who I was, that I was a fan, and that I would like to help him with anything he needed. We proceeded to talk about music and life for what felt like hours, but in reality was only about 20 minutes. A few weeks later I went to see him perform a solo show in Charlotte, North Carolina. We continued to stay in touch after that. I knew he was a little gun-shy of music business folks based on his past. So we took it slowly, but we began to develop a good rapport. We had about a two year “courtship” before we decided to enter into any sort of formal agreement. It was now fall of 2002 and we had continued to talk seriously over the past couple of years about working together. I had even flown to Cape Cod to meet with him to discuss music and his career. We met for a simple lunch at Applebee’s and that day could be considered the beginning of our working relationship. As we were laying out the ground rules, as managers and artists often do in the early stages, I distinctly recall him saying one thing that resonated deeply. On several occasions he said, “Dave, I’d like for us to work together, but I should tell you, I will never play in Stryper again.” Yet, later that year Stryper, with Michael included, embarked on a 7-week nationwide tour. 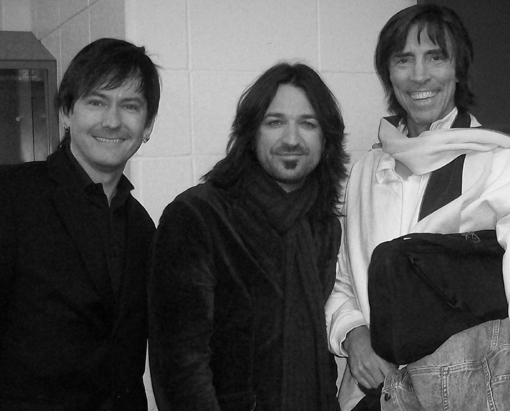 It was their first tour together with all original members since their break-up in 1991. I couldn’t believe I was involved in reuniting the band that had meant so much to me over the years—that for all practical purposes was the reason I wanted to be in the music business. What made Michael change his mind and decide to do a Stryper tour? To this day, I’m not really sure. I wouldn’t say that I pressured him. I don’t believe I did, although I’m sure I was nudging in that direction. But no amount of nudging can make Michael change his mind. It had to be something else that persuaded him. Perhaps he just felt it was the right time. Whatever it was, I wasn’t going to question it. When we started working together, it was with the intent of releasing some solo material. That material coalesced into Reborn, the first Stryper studio album since Against the Law. However, Michael had it in his heart that he wanted to be a solo artist, not because he didn’t like Stryper, although there was definitely some deep-rooted pain associated with the band, but because he just wanted to be his own person and make a name for himself outside of Stryper. His longing for a solo career had less to do with his feelings about Stryper and more about his basic human instinct to prove to himself that he could stand on his own two feet. 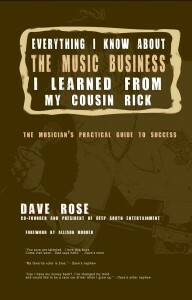 As an experienced professional in the “new” music business of 2003, I knew solo work could be a very difficult path. Although I remained supportive of his solo endeavors, as I still do, I explained that the quickest path to gaining the attention of the world would be to tour with Stryper. It would be the most direct way to let Stryper fans know that he was alive and well, and sounding better than ever. That 2003 tour was a success. And it gave birth to the live album 7 Weeks, Live in America that would find its way onto three Billboard charts (Internet, Independent, and Christian), debuting at #4 on the Billboard Internet Chart. That tour, which started as a one-time only engagement with no promises of a future, turned into a record deal with Big3 Records, which led to subsequent tours and albums. Stryper was back together. Reuniting a band, who for all practical purposes had not been a proper business since 1991, required a lot of work. We had to completely re-build. We formed new corporations and hired lawyers, booking agents, accountants, and crew-members. The band didn’t have a single Stryper T-shirt available for sale when we started the process. But day-by-day we laid the ground work to rebuild the business of Stryper. I would spend the next several years getting to know the band that at one point were my childhood musical icons. I’ve come to know and love them all, but of the four I am the closest with Michael. Michael is the hardest working of the bunch. He never stops pushing himself, and the band, to improve. When tour time approaches he hits the treadmill, he rehearses, and he practices his voice and instrument. He is truly working 365 days a year. That is probably why I gravitated toward him early on in my working relationship with the band. I understood his way of thinking and the lifestyle that accompanies it. That said, his quest for perfection has often been the catalyst for my rising blood pressure and a few new grey hairs. He has postponed video shoots because he felt the band was not at their best. He has cancelled interviews because it would strain his voice and thus sacrifice the show. And in his mind, the show was, and is, THE most important thing. He will ask me to make demands on promoters that I may view as unreasonable, but that he views as necessary in order to put on the best show possible for the fans. He’s a perfectionist in every sense of the word. And sometimes that doesn’t jive with the business world or, more specifically, me. I have to deal with the potential repercussions of a cancelled interview or an angry promoter, but in Michael’s mind, that’s what it takes to give the fans the show they deserve. I don’t always agree with Michael, but I always understand him, and I certainly always respect him. I’ve been working with Michael since 2003 and consider him to be a true friend. I had the honor of delivering a toast at Michael and Lisa’s wedding. We’ve been through a lot of ups and downs together, personally and professionally. In the music world, after 10 years of working together, many are ready to put on the boxing gloves and duke it out. I’m happy to say this isn’t the case with Michael and me, and I feel equally as comfortable with Michael in a church, in a movie theater, or in a bar. I’ve always known Michael’s hard work would pay off. I believed there was a world outside of Stryper where he would be recognized solely for the incredible talent that he is and not so much as a member of a groundbreaking Christian rock band. This is not to diminish the place of Stryper in his career. I just always had this gut feeling that his future held something exciting for him outside of the Christian rock scene. That future arrived in 2007 when I received an email from Kim Scholz (wife of Boston’s Tom Scholz) asking if Michael would be interested in performing at a tribute concert to Brad Delp, the former Boston singer who had died in March of that year. Members of Boston along with a smorgasbord of “Who’s Who” in rock music were invited to perform. Michael happily agreed to sing a few the band’s songs with the other members of Boston. The show took place August 19, 2007, at The Bank of America Pavilion in Boston. The most faithful of Boston fans were out in full force to pay respects to their hero, Brad Delp, one of the greatest rock singers of all time. For the first time since I’ve known Michael, I was nervous for him. I wanted so badly for a world outside of Stryper to see him shine as the amazing musician and vocalist that I have always known that he is. He was about to go on stage in Boston and perform with the remaining members of Boston to what could potentially be the most difficult crowd he’d ever performed for. He was about to sing Boston songs to Boston fans, all of whom were very emotionally charged coming off the death of Brad. This was a recipe for disaster. I was truly a nervous wreck. Before the show I headed to a bar located inside the Pavilion. I needed a beer or two to calm my nerves and I knew if I hung around with Michael backstage he would sense my nervousness, and I certainly didn’t want that. So I found a barstool and proceeded to calm my pre-show jitters. As I sat there contemplating all the things that could potentially go wrong, but still convinced that Michael would handle the night with professionalism, five guys walked in the bar and sat down next to me. They were locals, no doubt about it. One was wearing a Red Sox baseball cap. Another had on a classic Boston Spaceship T-shirt. And they all had thick New England accents. “Yeah. Whatever. No way he’ll pull it off like Brad did, but it’ll be cool. This may be the last time we get to hear these songs live,” said Spaceship. “That’s true. This may be the last time we hear these songs live—So Jesus Dude better not f**k it up for us!” exclaimed Red Sox as they all laughed and high-fived each other. No words I could have said would change their opinion of “Jesus Dude.” They were going to have to hear it for themselves and make up their own minds. But this pre-show moment in the bar confirmed that tonight would be an amphitheater filled with skeptical naysayers. The only thing I could think to do was order another beer. Until now I had never simultaneously prayed and chugged an Amstel Light at the same time. I finished my beer and headed into the concert area. I set up shop near the back row. I suppose I felt less nervous being furthest from the stage, but I also wanted to watch the crowd’s reaction from the rear of the venue. Michael came on stage with the confidence and grace I’ve come to expect from him, yet with all the humbleness and sincerity of someone paying genuine respects to Brad. Still, I was a wreck. His moment arrived when the band started playing the Boston classic “Peace of Mind.” My heart sank. I knew Michael had the chops to hold his own, but one screw-up and he was potentially facing a brutally unforgiving audience of Delp fans. It was an amphitheater filled with 5,000 or so fans like those I had just encountered at the bar, all with the sense that this may be the last time they hear these classic songs performed in concert. 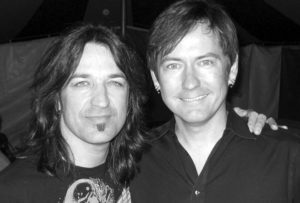 Michael Sweet had performed to tough audiences before—most notably at heavy-metal festivals where the attendees are some of the most cynical music fans in the world. And he did a fine job at winning them over, but that was always within the confines of Stryper—his comfort-zone, so to speak. To date, Michael had never performed in another band of Boston’s caliber, and here he was performing the vocal parts of a recently deceased singer. I had no doubt he was one of the best at winning over tough audiences, but this was different. Could he pull this one off? The signature guitar sounds of Tom Scholz blared over the PA system and the crowd cheered loudly as they began to recognize the song. Within seconds, before he even started to sing, Michael had the audience on their feet with hands in the air clapping along. Then it came time for the opening line and he belted it out as strongly as I’ve ever heard that angelic voice of his. The crowd stayed right there with him, singing along, hands in the air, and going wild. This pattern continued throughout the night. He had done it. He was one with a Boston crowd, in Boston. He had the approval of the fans of one of the greatest rock bands of all time. In my mind, that was the night. 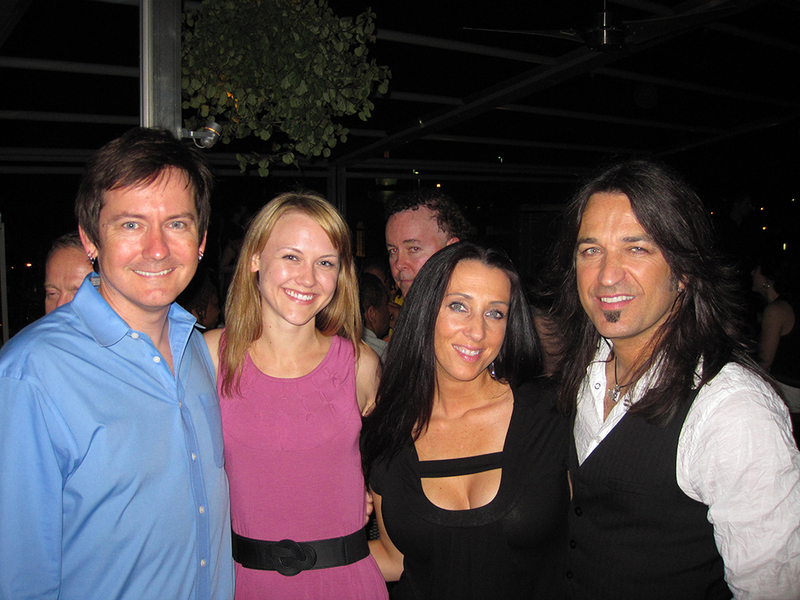 It was the night 5,000 people found out what I and other long-time loyal Stryper fans already knew—that Michael Sweet is one of the most talented rock vocalists in the world. On that night he held his own with a crowd that for the most part had no idea who he was, or at best knew him as “That Jesus Dude.” In the end, they knew him as the guy who did great justice to the spirit of Brad Delp. Michael went on to become a touring member of Boston during 2008. I’d love to lean back in my chair, light a cigar, prop my feet on the desk and tell you I orchestrated the whole thing. But I didn’t. His union with Boston and recognition the world over as a talented musician came about because of his hard work and devotion to his craft. It happened naturally—the way great music usually does—without the intrusion of managerial finesse. It happened because Michael is truly an amazing talent. When Stryper fans ask me, “What’s Michael like?” I respond with “He’s pretty normal.” He’s not, actually. He’s insanely motivated and driven, and sometimes he has a fairly strange sense of humor. But as a human being, he’s actually pretty normal. I recall going to Boston during the recording of Reborn as the area got hit with a really bad snowstorm. I was in the studio with engineer Kenny Lewis. At some point we looked around and couldn’t find Michael. We walked out the studio door and there was Michael with a big smile on his face shoveling snow off the sidewalk. He just disappeared, grabbed a shovel, and started shoveling snow without telling anyone. That’s Michael Sweet, equally as happy recording a Billboard-charting record as he is shoveling snow. I tell people all the time that I haven’t worked a day in my life. It’s because I do what I love—music. And I have Stryper to thank for putting me on that path. I feel as though I have truly lived The American Dream. I went from selling my stereo for Stryper tickets to managing the band, all in one lifetime. This is the effect Stryper has on people every day. They give people hope and inspiration. They help you believe in yourself and that you have the ability to do anything you set your mind to. I am living proof of that. I walked out of my very first concert, a Stryper concert, saying “This is what I want to do with my life.” And I did. Thank you Tim, Oz, Rob, and Michael for giving me hope at such a young age, and for believing in me for so many years as your manager. You all are truly amazing people and I am forever grateful for being a part of your organization.